Achieving success by building lasting relationships and delivering innovative financial solutions with exceptional customer service. Community Development Bank was founded in 1906 and purchased by three non-profit Community Development Corporations in 2001. A for-profit financial institution owned by non-profit Community Development Corporations is very unique and brings significant economic development resources to the communities we serve. We generously support local non-profit organizations, fundraisers and student groups with financial contributions. Additionally, we provide scholarships and internship opportunities to local high school and college students. You’ll regularly see our staff volunteering at community events, coaching youth sports or serving on local non-profit boards. 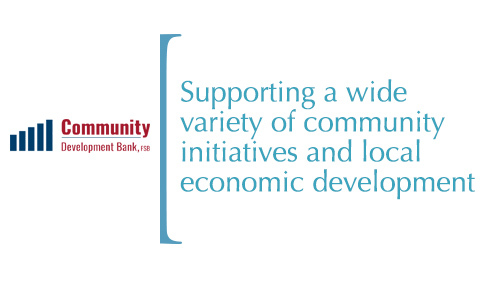 When you bank with us, you’re supporting a wide variety of community initiatives and local economic development. We are excited about the future and look forward to continuing our work with loyal partners and customers to make our communities great places to live, work and raise a family.